Growing up my siblings and I had free range of the 5+ acres of land around our house in southern Ohio that included a stream, woodland forest, and a grassy meadow. My parents were very intentional about educating us about the native plants that grew in the area, which ones were safe to play with and which ones weren’t. Still, we would often come home with scratches, and stings from various plants. Like the time I was playing doctor and decided that I needed to rub a “mysterious leaf” all over my body. That leaf turned out to be not so mysterious once the red poison ivy rash showed up. Perhaps not my brightest childhood memory. The one plant I learned to identify very early on and stayed far, far way from were stinging nettles. Their painful, stinging hairs leave a prickly rash on the skin and if you find yourself in a grove of nettles they are near impossible to avoid. Right after Alaina proposed to me almost two years ago we took our mountain bikes on a bike train through the forest on Whidbey Island. It was a ton of fun, except for where the nettles had grown to over 10 feet tall and were encroaching on the path. We peddled through, flailing our arms out of the way and swerving, trying to avoid the stinging hairs of the leaves. Luckily we made it through with only minor blemishes. Apparently, the slime of a banana slug neutralizes the stinging, however, I think it would take a lot of stings for me to be convinced to rub a slug all over me. For generations early spring nettle shoots have been harvested for eating, though they should be handled very carefully and only eaten raw by an expert, once they are cooked the poisonous chemical is removed and they are safe to eat. They are rich in vitamins A, C, iron, potassium, manganese, and calcium, and have a similar taste to spinach, though I found them to be more earthy. There are often made into soup or steeped into a nutritious tea, though they can be used in place of spring greens in most any recipe. We still had a lot of eggs hanging around so I decided to work them into a frittata. Like I mentioned above nettles are very prickly and should not be handled without protection. I used kitchen tongs and scissors to trim off the leaves and discard the thick stems. Thick garden gloves would also work. 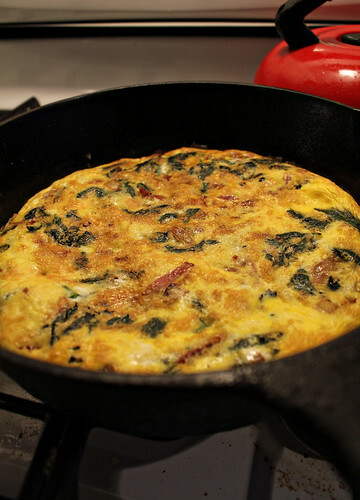 Frittatas are very versatile and very easy, you can use any combination of seasonal fillings. The only fickle thing is the pan, first it should be about 10″ across, then you need to make sure you have one that is both oven and broiler safe. I use my well seasoned cast iron pan, but you could also use a good quality stainless steel pan with stainless steel handle. 4 or so cups fresh nettle leaves. Thick stems removed. In the skillet over medium-high heat cook the bacon until its crispy. Remove the cooked bacon from the pan and allow to cool on paper towel. Reserve 1-2 Tablespoons bacon fat in the skillet. Once the bacon is cooled, slice or crumble it into 1/4 inch pieces. Add the onion to the skillet and cook over medium-high heat until beginning to soften. Add the nettle leave and cook until wilted but still bright green. 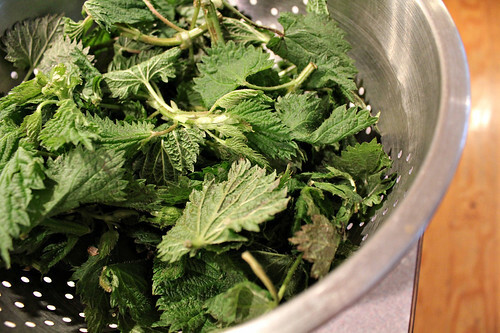 While the nettles cook whisk the eggs, milk, cheese, salt, and nutmeg in a bowl. 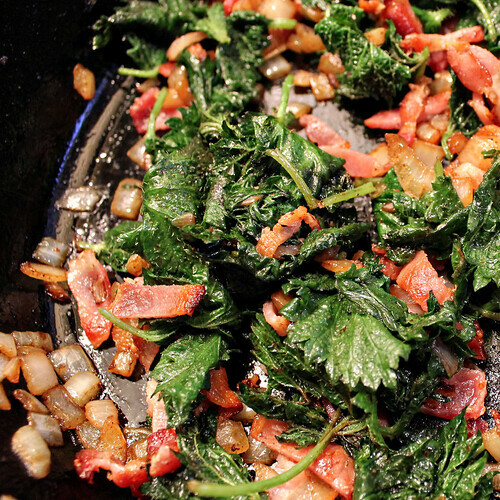 When the nettles are tender, add them to the egg mixture along with the crumbled bacon. Wipe the skillet clean and add about half a tablespoon of olive oil. Return to medium heat and add the egg mixture to the pan. Evenly distribute the nettles and bacon around in the pan if needed. Pre-heat broiler. Cook on the stove top until the edges of the frittata are set, about 5-8 minutes. Slide into the oven for a minute or two, until the eggs are set and the top is lightly browned. It tends to cook very quickly so don’t walk away. Cut into wedges and serve immediately. Serves two as a main course with lunch leftovers. This entry was posted in entree, Farm-to-Table, Quick dinner, Spring and tagged Bacon, Eggs, entree, Native Ingredients, Recipe, Spring. Bookmark the permalink.